Designing a productivity application to have related data and functions in one place is good practice because more can be done without having to switch back and fourth between screens. That is why many people like Excel — there is the ability to edit data real-time in a fast and efficient way. 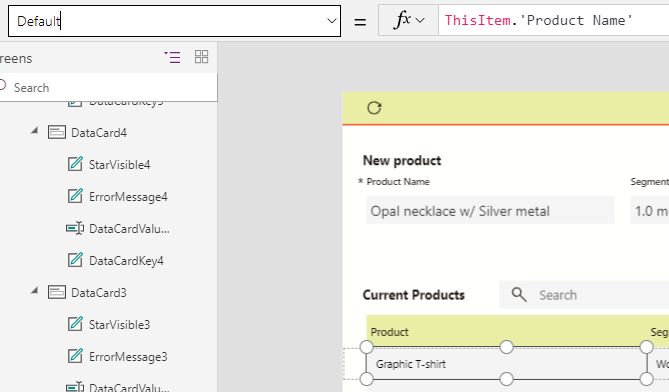 In PowerApps, you can implement the same concept by providing it as a front end to any data source, with the ability to customize it even more. A small business owner has a catalog of product information that is updated each time she gets a new shipment. Needing to input every item herself, these logging processes can be time-consuming, and sometimes error-prone. She builds a quick PowerApp that can log new items and change item data in line on the same screen, directly to the data source. With this app, she can interact with the data in the database quickly without having to connect through a separate interface, and she can include other important data and functions in the same application to host everything in the same space. This step adds a form control to add new items. In the flyout, connect the data source to the one you just connected to, or manually update the DataSource property in the formula bar. To edit items in-line, insert a gallery control with text input boxes. In some cases it is a good idea to disable the gallery until the user specifies they want to update the data. You can download the PowerApp and CDS Products entity schema shown in the blog here. If you use the accompanying CDS entity, import the solution to add it to your Environment with a CDS 2.0 instance. Select Publish all customizations, then Close the window when complete.